Today, we’re going to talk about an absolutely wonderful biological machine, called ATP-synthase, another marvel built on almost every living beings that fascinates and intrigues naturalistic minds! Again, to conceive that such a intricate system could have arisen after random mutations defies logic. But, unfortunately, nothing prevents evolutionists to contrive the most bizarre hypothesis with the purpose of giving the credits to chance, nothingness again. ATP Synthase is a molecular machine found in every living organisms. It serves as a miniature power-generator, producing an energy-carrying molecule, adenosine triphosphate, or ATP. The ATP synthase machine has many parts we recognize from human-designed technology, including a rotor, a stator, a camshaft or driveshaft, and other basic components of a rotary engine. This machine is just the final step in a long and complex metabolic pathway involving numerous enzymes and other molecules—all so the cell can produce ATP to power biochemical reactions, and provide energy for other molecular machines in the cell. Each of the human body’s 14 trillion cells performs this reaction about a million times per minute. Over half a body weight of ATP is made and consumed every day! ATP-driven protein machines power almost everything that goes on inside living cells, including manufacturing DNA, RNA, and proteins, clean-up of debris, and transporting chemicals into, out of, and within cells. Other fuel sources will not power these cellular protein machines for the same reasons that oil, wind, or sunlight will not power a gasoline engine. ATP synthase occurs on the inner membranes of bacterial cells, and the innermost membranes of both mitochondria and chloroplasts, which are membrane-bound structures inside animal and plant cells. ATP synthase manufactures ATP from two smaller chemicals, ADP and phosphate. ATP synthase is so small that it is able to manipulate these tiny molecules, one at a time. ATP synthase must convert some other form of energy into new ATPs. This energy is in the form of a hydrogen ion (H+) gradient, which is generated by a different whole protein system to ATP synthase. Hydrogen ions pour through ATP synthase like wind through a windmill. This comprises a positively charged electric current, in contrast to our electric motors, which use a negative current of electrons. ATP synthase is a complex engine and pictures are necessary to describe it. Scientists use clever techniques to resolve the exact locations of each of many thousands of atoms that comprise large molecules like ATP synthase. This protein complex contains at least 29 separately manufactured subunits that fit together into two main portions: the head and the base. The base is anchored to a flat membrane like a button on a shirt (except that buttons are fixed in one place, whereas ATP synthase can migrate anywhere on the plane of its membrane). The head of ATP synthase forms a tube. It comprises six units, in three pairs. These form three sets of docking stations, each one of which will hold an ADP and a phosphate. ATP synthase includes a stator (stationary part), which arcs around the outside of the structure to help anchor the head to the base. Notice in figure 1 a helical axle labeled “γ” in the middle of the ATP synthase. This axle runs through the center of both the head and base of ATP synthase like a pencil inside a cardboard toilet paper tube. 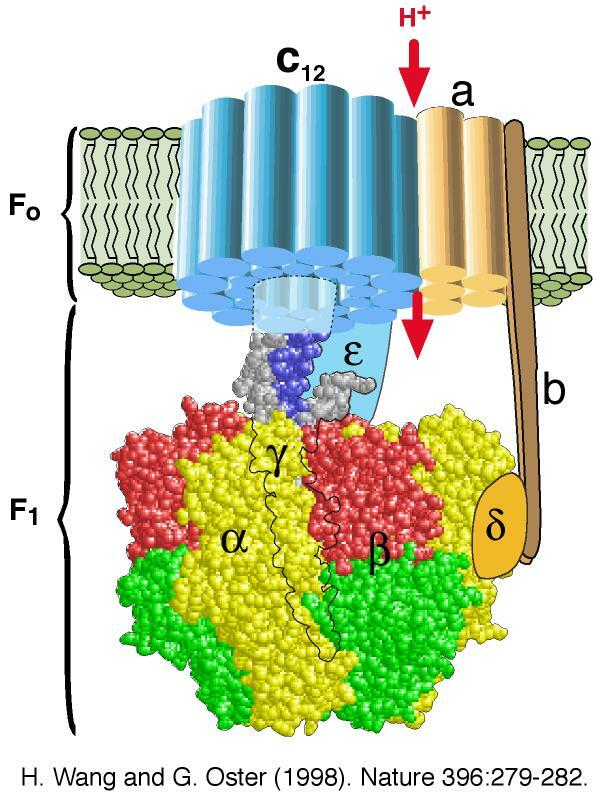 Here is the “magic”: When a stream of tiny hydrogen ions (protons) flows through the base and out the side of ATP synthase, passing across the membrane, they force the axle and base to spin. The stiff central axle pushes against the inside walls of the six head proteins, which become slightly deformed and reformed alternately. Each of your trillions of cells has many thousands of these machines spinning at over 9,000 rpm! In a paper published in March 1997, Hiroyuki Noji et al. directly observed the rotation of the enzyme F1-ATPase, a subunit of a larger enzyme, ATP synthase. This had been suggested as the mechanism for the enzyme’s operation by Paul Boyer.6 Structural determination by X-ray diffraction by a team led by John Walker had supported this theory. A few months after Noji et al published their work, it was announced that Boyer and Walker had won a half share of the 1997 Nobel Prize for Chemistry for their discovery. The F1-ATPase motor has nine components—five different proteins with the stoichiometry of 3a:3b:1g:1d:1e. In bovine mitochondria, they contain 510, 482, 272, 146 and 50 amino acids respectively, so Mr = 371,000. F1-ATPase is a flattened sphere about 10 nm across by 8 nm high—so tiny that 1017 would fill the volume of a pinhead. This has been shown to spin ‘like a motor’ to produce ATP, a chemical which is the ‘energy currency’ of life. This motor produces an immense torque (turning force) for its size—in the experiment, it rotated a strand of another protein, actin, 100 times its own length. Also, when driving a heavy load, it probably changes to a lower gear, as any well-designed motor should. However, how could ATP synthase “evolve” from something that needs ATP, manufactured by ATP synthase, to function? Absurd “chicken-egg” paradox! Also, consider that ATP synthase is made by processes that all need ATP—such as the unwinding of the DNA helix with helicase to allow transcription and then translation of the coded information into the proteins that make up ATP synthase. And manufacture of the 100 enzymes/machines needed to achieve this needs ATP! And making the membranes in which ATP synthase sits needs ATP, but without the membranes it would not work. This is a really vicious circle for evolutionists to explain. Some says that not every living beings need ATP-synthase, such as anaerobical bacteria, because they produce ATP via glycolysis only. Thus, they imply that evolution really occurred on the creation of ATP-synthase… But every organism need ATPase! Obligate anaerobes may not use ATP synthase to manufacture ATP, but they do use it to pump protons out of their cytoplasm. They would die otherwise. All cells have ATP synthase, because all cells need it. In sum, all life depends on ATPase, but not all life depends on it for ATP production. Anaerobic bacteria use it to maintain pH balance instead. So ATPase must have been present in the very first cell. So, the evolutionary dilemma only strengthens! Oh, surely they miss the Darwin’s epoch, when cells were just organic “jellybeans”, which no complex content, the eye anatomy was the most complicated biological mechanism they’ve had to deal with (and even the contemporary knowledge of eye was enough to puzzle Darwin’s mind! ), there was no annoying DNA (with its smart informational content pointing to a intelligent Creator), second Laws of Thermodynamics denying spontaneous increasing in complexity of polymers occurring naturally, and so on… Damn it, science, always disturbing godless people dreams! 1 Stryer. L., Biochemistry, 18.4.3., The world’s smallest molecular motor: rotational catalysis, online: <www.ncbi.nlm.nih.gov/books/bv.fcgi?rid=stryer.section.2528# 2539>. 2 Lau, W. C. Y. and J. L. Rubinstein. 2012. 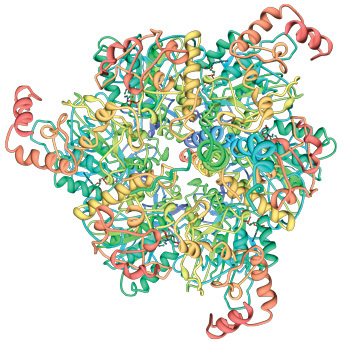 Subnanometre-resolution structure of the intact Thermus thermophilus H+-driven ATP synthase. Nature. 481 (7380): 214-218. 3 Evolution of the F1-ATPase <www.life.uiuc.edu/crofts/bioph354/Evol_F1.html>. 4 Lane, N. and W. Martin. 2010. The energetics of genome complexity. Nature. 467 (7318): 929-934. Howdy this is somewhat of off topic but We was thinking if websites use WYSIWYG authors or if you need to manually rule with HTML. I’m commencing a weblog soon but have zero coding expertise so i wanted to get guidance coming from someone together with experience. Any help can be enormously aptdiceaper! Após uma tentativa do google tradutor deu pra entender melhor o vídeo, belo texto! Meu anjo! Obr por dar uma lida, com vc acessando meu blog dá mais motivação para traduzir rs Paz do Senhor! Very good this video, how perfect! Only God to create something so perfect!